I’ve been wanting to run a Web Server from my home for many years. In fact, I have been paying for the domain Thor8.dk (my street address is Thorsvænget 8), and a fixed IP address for 5 years now – without getting it implemented. But today, with a little help from Jason Rivers who helped me set it up so it starts automatically on reboot, I have been able to deploy a MiServer – a web framework written entirely in Dyalog APL – on my Raspberry Pi (the one that is not embedded in the DyaBot) – at the address http://thor8.dk. Please be gentle with it, it is a very small machine on a regular ISP connection with only 1Mb upload capacity! The MiServer is a project that has been evolving for the last several years, with the goal of putting web application development in easy reach of those APL developers who are not also comfortable with mainstream web technologies like Microsoft IIS / ASP.NET, Apache, PHP etc. It is a web framework written entirely by APLers, for APLers – as an open-source project which is now available at https://github.com/Dyalog/MiServer. The motto of this project is that “Anyone who is able to write an APL function should be able to host it on the web”. 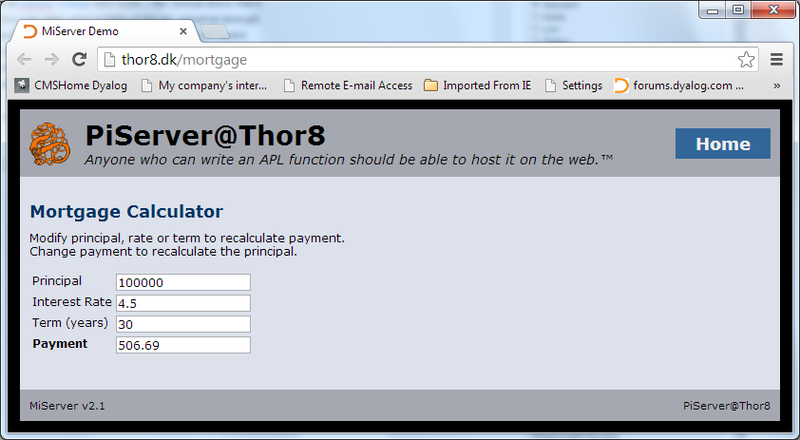 The site at “thor8” is a slightly modified version of the demo site that is included with the MiServer installation. Note that one of the features of the site is that, from any page, if you click on the Viking amulet in the top left corner, you can see the source code for the page. If you’d like to learn more about the MiServer, the User Guide is also available on GitHub. If you modify the principal amount, interest rate or the term, the calculator will calculate a new monthly payment. If you adjust the payment to something that you can afford, the principal amount will be adjusted accordingly. Every MiServer Page (MiPage) is a Dyalog APL class which derives from the base class MiPage. This base class adds the CSS (style sheet) and behaviour like the display of code. The main job of the MiServer is to move values arriivng from the browser, in the form of fields in an HTML form, or JSON data, to instance variables in your class. You need to name the fields that you want the MiServer to look for in order for this to happen (you can also retrieve other values using API function calls, but that is a longer story). These three lines of code are the actual application code – one function to compute the payment based on principal, rate and term – and another to calculate the principal based on the other three values. Within the function Render, which is called when the page is rendered, these lines of code create a 4×2 nested array containing labels in the first column, and HTML edit fields in the 2nd column. The function Table wraps an HTML table around this array and the Form operator wraps that inside a form which will use the POST method (although in this case, that actually never happens, we drive all activities of change events on the edit fields). Please take it for a spin – we are happy to receive comments on this blog, or via e-mail to apltools at dyalog dot com. The DyaBot will of course be running a PiServer too. More about that next week, the bot is also coming to Iverson College. Of course, it was an illusion that I would be able to get straight back to the robot after vacation, there were a few other jobs waiting like the Dyalog’13 Conference Programme (the DyaBot will be making a couple of appearances, of course!). However, it appears I have now made enough flour to be able to remove my nose from the grindstone for a bit and spend more time with the robot, so I expect to be back to posting every week or so from now on, as we prepare to demonstrate an autonomously navigating robot at the conference! The robot was placed in my kitchen (the setting for several robot videos), about 80cm from the back wall, 240cm from the front, and roughly halfway between the sides. The green rectangle labelled “actual” above shows the location of the walls relative to the bot. It was commanded to rotate through 360 degrees, recording the readings from the IR (red line) and Sonar (blue) sensors, which were both pointing straight ahead. Ideally, the blue line should have traced an identical rectangle. The red line essentially traces an 80cm circle plus noise, this is because SHARP GP2Y0A21YK0F infrared sensor has a maximum range of 80cm. 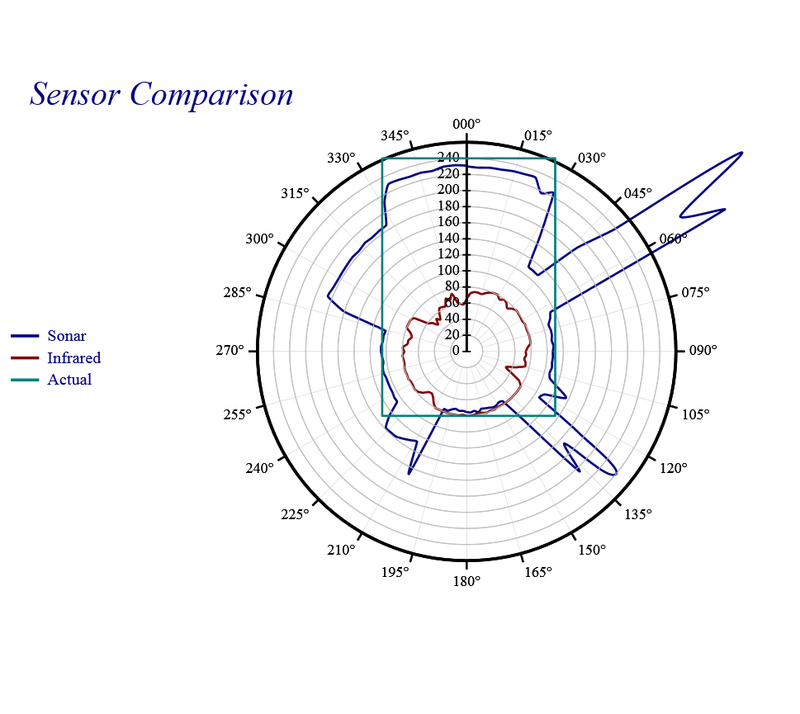 The ultrasonic sensor has a range of at least 6-7m, and is our choice for long-range distance measurements. However, what I believe the graph shows, is that we have a serious problem with reflections. Essentially, it appears that when the sonar beam hits a wall at certain angles, there is very little direct return; instead the beam is reflected. The return signals that we are getting from roughly 60 and 315 degrees look like reflections of the back wall – these reflections may be enhanced by the fact that there is a refrigerator at 60 and a dishwasher at 315 (metal surfaces). The signals at 135 and 220 degrees could be reflections of the robot itself, the beam having been reflected twice in a corner of the room. Another thing that is not immediately evident from the above image, but took me by surprise studying the data sheet, was that the sonar beam is a quite a bit wider than I expected – as much as 30 degrees at close range, getting narrower as the distance increases (see the data sheet). In other words, we have some work to do in order to generate accurate maps of the universe based on the current set of sensors.